Instagram has made a change that shares your photos to your Facebook albums instead of just sticking a link on your wall. Now when you select Facebook as an option when uploading a photo to Instagram, the image will be uploaded full-sized into a Facebook album named "Instagram Photos", along with your caption. As a result, your Instagram photos will appear nice and large on your timeline and it will be easy for your friends to browse past Instagram photos. Previously, only the instagr.am link was shared to your wall and your friends needed to visit that link in order to view your photo. Additionally, you couldn't tag people in the photos and 'likes' and comments were technically made to the shared link, not the photo. I was very excited when I noticed this change as I have been wanting Instagram to work like this for a very long time. I believe my Instagram photos will now receive more comments and 'likes' and I'm glad I'll be able to click through my friends' Instagram albums, since I know I miss many of their share photos. This change is only for photos uploaded to Instagram from now on. 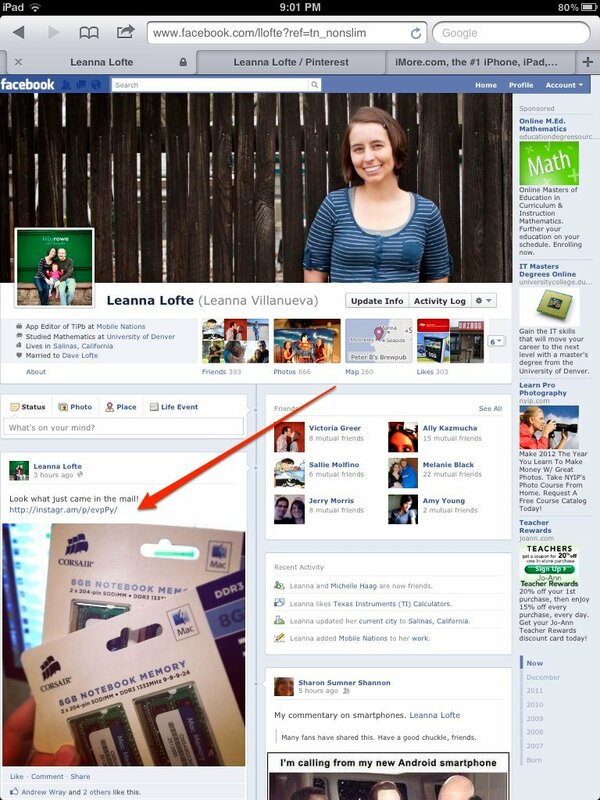 If you want to add previous photos to your Facebook album, you'll need to share it again from within the Instagram app.